Cast your favorite child as a storybook adventurer with this custom print. 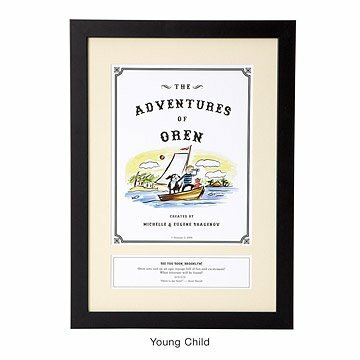 Cast your favorite little person as an adventurous literary figure—whether a newborn making a debut or a young child in the first few pages of his or her adventure—with this delightfully personalized print, featuring a custom, storybook-inspired illustration and your custom "review." For newborns, it's an imaginative antidote to ordinary birth announcements; for young children, it commemorates the magical story of early childhood. Customize the character to reflect your child of choice (skin tone for all, plus gender and hair options for older kids). Add parents' names as "authors" of this masterpiece and write a review of your little one's story (by you or another doting relative) to add a wry and endearing touch to the print. Charmingly illustrated by Patricia Carlin to evoke timeless storybook classics, it makes an unforgettable tribute that will transition from nursery to bedroom to grown-up keepsake. Printed and framed in BonanzaWood® frame in Portland, Oregon. For more storybook titles, check out our Personalized Storybook Art - Legend, Personalized Storybook Art - Brave, and Storybook Art - Amazing. Patricia Carlin started out as an art director in Philadelphia, selling everything from potato chips to financial products. In 2001, a friend wanted help launching a glassware business. Patricia designed several product lines for the new venture. "We couldn't afford a writer at first, so I wrote my own copy for the glasses," Patricia says. The business did well, and Patricia found herself designing a range of tabletop products. When a publisher noticed the glassware at a gift show, they saw book potential. With their help, Patricia produced two books: "Glam Girl" and "Geeky Girl." Patricia has explored many techniques in her illustration, but simple line drawing appeals to her most. "For me, paring things down to their simplest essence is always the best way to understand them," she says. "After I had my daughter I rediscovered the power these little sketches have to tell a story. Drawing was a fun way to communicate without language." She has won many awards for her design work and is the author of "How to Tell If Your Boyfriend is the Antichrist: And if he is, should you break up with him?" Inspired by classic children's literature illustrations, our Personalized Storybook Art - Adventure, illustrated by Patricia Carlin, offers creative portrayals of children as adventurous, timeless characters. Playful details like relatives' "review" of the child's debut and their birthday as "copyright" make this keepsake a truly individualized expression of a child's character, and a distinctive birth announcement or toddler tribute to be treasured for years to come. The Personalized Storybook Art - Adventure is packaged in a partially recycled and fully recyclable/compostable box. There's one place—and only one place—where you'll find the Personalized Storybook Art - Adventure: UncommonGoods. Comes ready to hang in wooden frame with Plexiglass, and incl. care instructions. Purchased as a gift for our grandson's first Christmas. We purchased a different one for our granddaughter almost 3 years ago. Different and unique, and a keepsake for years to come ! Gift to a new baby. My favorite baby gift ever! This is the fourth storybook art piece I have purchased and it has yet to disappoint. Such a special and unique gift for new parents - I promise it will be hung in the baby's room upon receipt. It's my new "go to" gift for special little ones in my life. I wanted to give this as a gift to my daughter for my first grandchild. Although the template is set up for birth date, weight, etc...the vendor was very accommodating to make the changes I needed to give it as a gift before the baby was born. Although my daughter has a registry, I wanted to give a special,personalized and unique gift that she would have for the baby's room. Quality is great and delivery was right on time! I have never been disappointed with anything I have ordered from Uncommon Goods...their customer service dept. is the best! Its a work of art!!! Got this for my niece who just had a baby. She loved it so much she hung it in her dining room. The quality and workman ship are superb. It is truly a work of art. It took a little while (about 10 days) to get the order confirmed (reviewing the proof and so forth), but once it was confirmed the print came out beautiful and shipping was performed on a timely basis (10 days). The framing is high quality and the print itself is perfect. This was one of the most fun gift 'projects!' My granddaughter, age 2 has a children's book-themed room.Instead of a baby shower, her mother received a children's books shower. So this is the perfect addition to her 'big girl room' as she looks forward to the birth of a sibling this Spring. Loved the options and categories to choose from, the quality of the product and how quickly it arrived.